(CNN) -- The world's oldest art festival has opened to the public in Venice, Italy featuring the work of 90 artists from 77 countries. 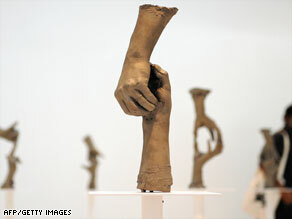 Bronze sculptures by American artist Bruce Nauman, whose show won the top prize at the festival. The Venice Biennale has been running since 1895, featuring architecture, dance, cinema and theatre as well as decorative art and is often described as the "Olympic games of the art world." The art exhibition is held primarily in the Giardini, a public park which holds 30 permanent national pavilions. This year Bruce Nauman from the U.S. won the top prize, the Golden Lion award for for best national participation. His exhibit, Topological Gardens, features fountains with water spewing from severed heads and neon words in humorous pairs in a garden setting. The size and splendor of the pavillions roughly reflect the political standing of their occupiers at the start of the 20th century. British film artist Steve McQueen, winner of the Camera d'Or prize for first time-directing at the Cannes Film Festival last year has won praise for his sensitive film on winter life in the Giardini, after the art world has gone home. The New Zealand contingent also caused a storm by performing a traditional Maori haka in St Mark's Square. The unlikely curator of the Ukrainian pavilion this year has sparked much interest. That Wladimir Klitchko should speak four languages and hold a PhD might be unsurprising, but that he is 6ft 5in tall, a world heavyweight boxing champion and Olympic gold medallist is a little more so. The opening of his pavilion last week was attended by supermodel Naomi Campbell, the artists Jeff Koons and Antony Gormley and influential British gallery owner Jay Jopling. The exhibits remain open to the public until November.